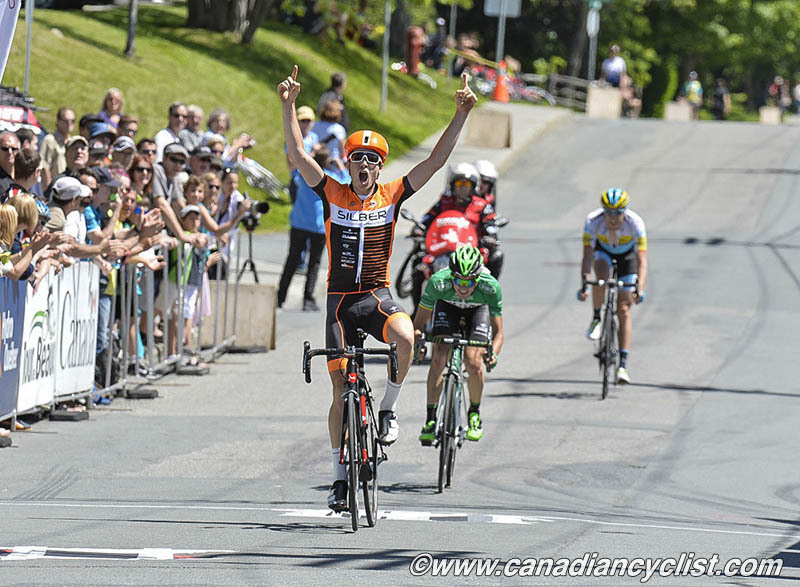 The final stage of the Tour de Beauce has more than once upended the standings, and this year was no exception. Race leader and defending champion Tom Skujins (Hincapie Racing) came into the final stage with a seven second advantage over team mate Dion Smith, nine seconds over Stge 2 winner Amets Txurruta (Caja Rural) and ten seconds in front of Pello Bilbao (Caja Rural). By the end of the 12 lap, 122 kilometre stage, Bilbao had won Yellow, finishing second in a sprint to Ben Perry (Silber Pro Racing). The ten kilometre circuit is deceptively difficult. Dominated by 1.5 kilometre climb out of the center of town, the riders zigzag through urban streets, constantly sprinting out of corners with little chance to rest. Only 63 finished the final stage, with 39 dropping out. The main bunch had only 18 riders left. Hincapie was under pressure from the first lap, as attacks flew off the front with various riders and teams trying to move up in the standings. "Hincapie worked very hard until two laps to go, and they controlled the race," said Bilbao. "We took advantage of a moment of weariness from them to attack, because we saw a great opportunity. I am impressed by our performance. I had some doubts about my form and after the time trial on Friday, which was not very good for us, I didn't know what to expect." An initial group of four riders off the front swelled to 14 as the race entered the final five laps, including potential GC threat Rob Britton (Team Smartstop). Hincapie was managing to keep the gap to under a minute with all the attacks, but it was taking its toll, and they started to shed riders. The final remnants of the original break were brought back with a couple of laps to go, but then Britton and Bilbao countered and were joined by Perry. Skujins clearly was in trouble, with only team mate Dion Smith to help chase, and they could not bring back the three leaders. The gap remained less than 20 seconds, but there were time bonuses on offer as well. Into the final 300 metres the break was only 16 seconds in front of the desperately chasing Skujins group, but it was enough to put Bilbao in Yellow. For Ben Perry, it is the best result of his career. "I played my cards and I expected good opportunities. I was well positioned in the last two laps, and didn't do much work because of my team mate Ryan [Roth, fifth in General Classification]. So for the sprint I was definitely fresher. This is my career best result, and I am very happy for my team to be able to win the stage." Skujins finished second overall at 15 seconds, followed by Smith at 22 seconds. Smith also won the Points and Best Young Rider jerseys, and Mauricio Ortega (Orgullo Antioqueno) kept the Climber's Jersey he held all week, while Caja Rural took the Team GC title.